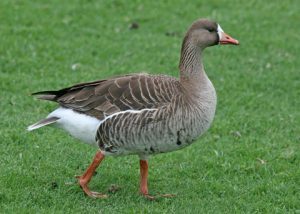 The Greater white-fronted goose belongs to the family of goose as the name suggests. 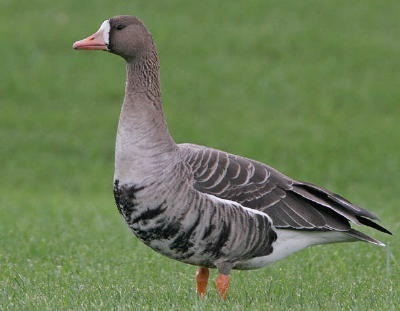 In Europe they are known as “white fronted goose”. They are named so because of the scrap of white feathers surrounding the base of their bill. They are more noticeable for their salt and pepper markings on the breast. In North America, Fronted geese are also called the “specklebelly” because of such markings. This species are smaller in size than that of the Greylag Geese, a popular bird belonging to the same species. Five sub-species of greater fronted goose have been identified yet. Greater fronted goose looks like the description given below. Length: They grow to a length of 64-81cm. Weight: Normally they weigh around 1.93-3.30kg. Legs: Fronted geese have short orange legs along with mouse colored upper wings covert. 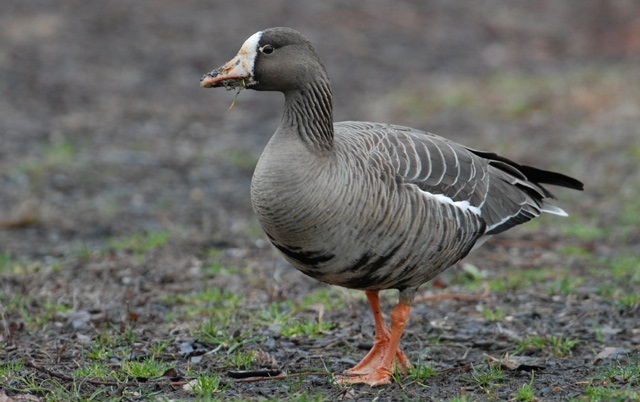 Color: Fronted geese are grayish brown in color. Bills: Both male and female geese have pinkish bill. Various breeds of domestic geese consist of a while line behind their bill. Wingspan: They have a 130-160cm wingspan. Plumage: Adult geese have gray-brown plumage. Feathers: They have dusky light brown feathers. Their distribution range spreads from eastern Canada, covering Alaska, Texas and western Canada. Locations like New England, Florida, California, Greenland, Mid-Atlantic plains, British Isles and Central Canadian Arctic count under their distributional range. They prefer gathering on the grassy plains of Eastern Alberta and Western Saskatchewan. These geese prefer staying on wet grasslands, salt marshes and estuaries. In winter months, they are mainly seen on farmland and freshwater marshes. 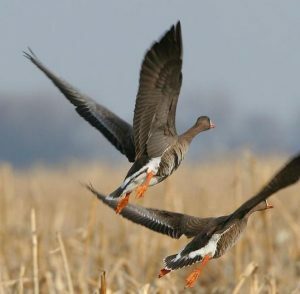 Fronted geese are mostly found in open habitats where they have easy approach to shallow waters as well as agricultural fields. Their diet comprises of local grasses, grains and seeds of different species of plants. They reap grass as well as aquatic plants. Especially in the winter months, they feed on waste grain and seeds. They also prefer having stems and roots sometimes. These geese eat some invertebrates as well. Their diet depends on their mood. This species of geese are known for having unique behavioral pattern. White fronted geese are often seen foraging over fields for food. They love to play while having bath. These birds sleep in safe perching areas. More often than not, they are found flocking around with other species of goose. During daytime, fronted goose perch on water and go out to feed the smaller ones. When threatened by predators, they will lift off quickly. These geese are territorial during their breeding season. There are some local nest predators like foxes, wild cats, jaegers etc. These predators are often seen destroying the nests of these birds. This species of geese are well adaptive to the wet grasslands because of having some great adaptive features. Their bills help them out find foods from the forested lands. Their color helps them to hide from the predators. Greater white-fronted geese are common spring migrant in South Dakota. They are also seen during the fall migration. They migrate on the arctic tundra in the month of summers, in winters they migrate to California, Oregon, New Mexico, and Mexico. Geese prefer following the same routes and same stopover points every season. These geese fly low over the town. When threatened by predators they quickly lift off making an alarm call and fly low over the town settling in safer areas. They usually have musical barking calls, especially when they fly. They do not breed before 3 years of age. Geese mostly breed in the winter months. This species of birds lays three to five eggs in their respective nests on the tundra. A female goose lays as well as incubates 3-6 eggs for more than 20 days. The goslings come out of the nests immediately after hatching. The juveniles can self-feed themselves as well as can walk and swim. Fledging occurs within 3-4 weeks. Female geese builds fluffy slump comprised of plant material near the water. They prefer building nests near water for safety from the predators. The young geese live with their parents for the first year. After a few days, they come out of their nests and try to do everything on their own. The little one starts flying after 1 year covering short distances. They are fast learners and their first flight starts after 38 days. Average life span of great fronted goose is 5-6 years. Some even live for 7 years. IUCN enlisted fronted goose in the least concerned category. Their population is decreasing and they are vulnerable only because of their less population as well as restricted distribution. They are often seen feeding by dabbing in the water and grazing in the fields. White fronted goose pairs stay together for many years and they also migrate together. Their family bond last longer compared to that of the other species of ducks. 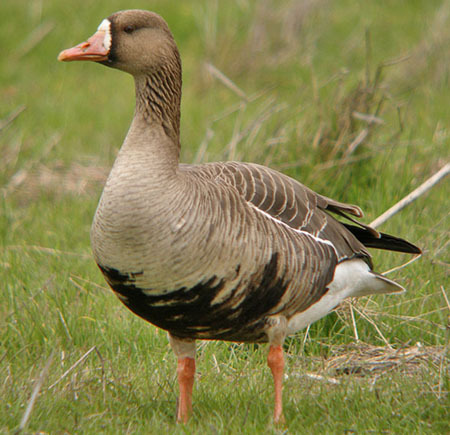 The Greater White Fronted Goose is very much similar to Lesser White Fronted Goose. European Fronted Goose are completely different in their behavioral patterns than that of the Greenland White Fronted Goose. Of all the other species, the Tule Goose is very rare. Here are a few images of greater fronted goose.